by John D. Callahan, Copyright © 1999, 2002 by Faith & Reason Ministries. 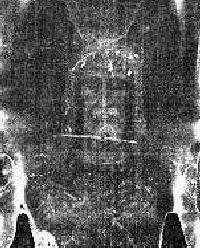 The eerie image above is from the Shroud of Turin , which many believe is Jesus' surviving burial cloth. It may turn out not to be, but regardless, the world is full of an overwhelming amount of evidence supporting the deity of Christ. (Also see "Quest For the True Cross" at portfolio.) Jesus is the most alive person today: people still love him and still hate him. Most of the world stops to celebrate his birthday, and he is the only person to ever convince a large portion of the population (billions) that he was God. A summary of the writings from these Web pages concerning the deity of Jesus is given below. Science and Christianity: Chapter 3. Who Are God and Satan, Really? We have now briefly considered many of the prominent religious and moral leaders of history. None actively denied the existence of the supernatural, most believed in some form of it, but Jesus made a startling claim about himself. Jesus claimed to be God! He did not claim to be just a messenger or prophet from God, but rather he claimed to be God incarnate. Now this is very interesting and deserves further attention. For if it is true, we have only to study Jesus' life and words to discover much about who God is and his relationship to man. All other information about God will have to be interpreted in the light of what we know about Jesus. We are tempted to say, "God would never appear as a man, let alone at the time and in the form of Jesus." This is only a theory however. Let us consider objectively the historic and scientific evidence surrounding the life of Jesus Christ. First we need to realize that the Gospels, the most detailed history we have of Jesus' life, are very authentic -- actually more so than any other writing of antiquity. We have thousands of manuscripts and some date to within only a century of the actual writings. A careful study of the manuscripts shows that they are nearly identical. These facts mean that the Gospels we have today are almost identical to what was actually written many centuries ago. The Gospel of Mark was written around 50 A.D., that of Luke, 60 A.D., that of Matthew, 70 A.D., and that of John, 80 A.D. Concerning the internal validity of the writings, the following may be said. The Gospels were written by four different men of various backgrounds. They were not in close collaboration when they wrote, but their histories of Jesus agree on every major detail. The several other authors who contributed to the New Testament, such as Peter, Paul, and James, also all agree on Jesus. What was written has also stood the test of historical scrutiny. That is to say, archaeological evidence and concurrent secular writings strongly support the internal validity of the New Testament. Luke in particular was an excellent historian. Given that the Gospels are authentic and valid, which they strongly seem to be, there is really very little question about Jesus' divinity. He claimed numerous times to be God's only Son, promised eternal life to His followers, did all manner of miracles, and rose from the dead as He promised. In delving deeper into these issues, let us consider who Jesus himself claimed to be. This is important, because almost no one would deny that Jesus lived and was a great man. So what did this great and noble man say about himself? Well, it has been said that anyone who can read the Gospels and not see that Jesus claimed to be more than a man can also look all over the sky on a cloudless day at high noon and not see the sun. Jesus claimed to be God in his direct speech. Let us consider a few examples: "Your father Abraham rejoiced that he was to see the time of my coming; he saw it and was glad." They said to him, "You are not even fifty years old -- and you have seen Abraham?" "I am telling you the truth," Jesus replied. "Before Abraham was born, 'I Am' " [John 8:56-58]. This passage, from the Gospel of John, seems to indicate Jesus' pre-existence, but its full meaning is brought to light from the Old Testament: God answered, "I will be with you, and when you bring the people out of Egypt, you will worship me on this mountain. That will be the proof that I have sent you." But Moses replied, "When I go to the Israelites and say to them, 'The God of your ancestors sent me to you,' they will ask me, 'What is his name?' So what can I tell them?" God said, "I Am Who I Am. You must tell them: 'The one who is called I AM has sent me to you' " [Exodus 3:12-14]. In other words, Jesus claimed the name of God: I Am. Further consider these words of Jesus: "You belong to this world here below, but I come from above. You are from this world, but I am not from this world. That is why I told you that you will die in your sins. And you will die in your sins if you do not believe that 'I Am Who I Am' " (John 8:23-24). Jesus was put to death for being Who He was; let us consider an excerpt from His trial: "Again the High Priest questioned him, 'Are you the Messiah, the Son of the Blessed God?' 'I am,' answered Jesus, 'and you will all see the Son of Man seated at the right side of the Almighty and coming with the clouds of heaven!' " (Mark 14:61,62). Besides His direct claims to deity, Jesus also implicitly claimed to be God in His life and words. Jesus accepted worship as God in the stories of the man born blind (John 9) and the leper who thanked Him after being healed (Luke 17). Jesus praises Peter after Peter's proclamation: "You are the Messiah, the Son of the living God" (Matt. 16:16). Similarly, Jesus accepts Thomas' words to Him: "My Lord and my God!" (John 20:28). Note that Thomas directly calls Jesus God. We might also note here that every New Testament writer accepted Jesus' divinity. For Paul's explanation see Colossians 1:15-19. Another way Jesus showed his divinity was to promise eternal life to his followers. The average man or prophet just doesn't do this. Only God has the power to give eternal life. Consider Jesus' words: "Whoever drinks this water will get thirsty again, but whoever drinks the water that I will give him will never be thirsty again. The water that I will give him will become in him a spring which will provide him with life-giving water and give him eternal life" (John 4:13,14). "For what my Father wants is that all who see the Son and believe in him should have eternal life. And I will raise them to life on the last day" (John 6:40). "I am telling you the truth: he who believes has eternal life" (John 6:47). "I am telling you the truth: whoever obeys my teaching will never die" (John 8:51). "I am the resurrection and the life. Whoever believes in me will live, even though he dies; and whoever lives and believes in me will never die. Do you believe this?" (John 11:25,26). In His description of judging all mankind at a latter date in time Jesus makes this statement: "These, then, will be sent off to eternal punishment, but the righteous will go to eternal life" (Matt. 25:46). Also from Matthew we read "And everyone who has left houses or brothers or sisters or father or mother or children or fields for my sake, will receive a hundred times more and will be given eternal life" (Matt. 19:29). Remember, now, these are the words of a man who almost everyone would agree was one of, if not the most, noble and good who ever lived. The typical man on the street if he is not a believer in Jesus would at least say Jesus was a great and good man. The Muslims consider Jesus to be a great prophet, and Buddhists often praise Him. If Jesus is so great and good, would He lie about such things as His identity or His ability to grant eternal life? Of course not! Next let us consider Jesus' power to perform miracles. Just as with His claims to deity, Jesus' miracles leap off almost every page of the Gospels. He had power over nature, sickness, and even death. Jesus turns water into wine (John 2), calms a storm at sea (Matt. 8; Mark 4; Luke 8), walks on water (Matt. 14; Mark 6; John 6), and multiplies food in an instant (Matt. 15; Mark 8; Matt. 14; Luke 9; John 6; Mark 6). Jesus healed many, many people. All of the accounts are not given for we read "Jesus healed them all." However, just to mention a few of the healings for which we have details, consider the man with a dreaded skin disease (Matt. 8:1-4; Mark 1:40-45; Luke 5:12-16), the paralyzed man (Matt. 9:1-8; Mark 2:1-12; Luke 5:17-26), the woman who touched Jesus' cloak (Matt. 9:18-22; Mark 5:21-43; Luke 8:40-56), the two blind men (Matt. 9:27-31), and the man with a withered hand (Matt. 12:9-14; Mark 3:1-6; Luke 6:6-11). As if these feats of healing weren't enough, we also have three accounts of Jesus raising people from the dead. They are the raising of Jairus' 12-year-old daughter (Matt. 9:18-26; Mark 5:21-43; Luke 8:40-56), the raising of the widow's son (Luke 7:11-17), and the raising of Lazarus (John 11:1-44). The reader should really take the time to read these incredible accounts. In addition, Jesus Himself rose from the dead, and not only this He calmly predicted it and gave many details on several occasions. This fact is thoroughly supported by the Gospels (John 2:18-22; John 12:27-33; Luke 9:22; Matt. 16:21; Mark 8:31; Matt. 20:17-19; Mark 10:32-34; Luke 18:31-34). Besides all this evidence, even secular history confirms that Jesus lived, was crucified, and that His body was never found. It also confirms that He has been worshipped as God by millions upon millions of people for the past 2,000 years. Again, no other great religious leader ever claimed to be God, and no one who ever lived has convinced a large portion of the population that he was God -- except Jesus Christ. Of all great men, only Jesus predicted His own resurrection from the dead and then calmly proceeded to do so. Only Jesus' tomb is empty. Of the many documented, undeniable miracles which are still performed today, the vast majority are done in the name of Jesus Christ. Who Jesus was is not a matter of religion. It is not even a matter of opinion. It is a matter of fact. Jesus was God, period. I have only given a brief overview of the vast evidence. If the reader would like to study the matter further he may wish to consult the many books written on the subject. In particular I recommend Josh McDowell's excellent work Evidence That Demands A Verdict. Before moving on, it need be stated that no one who sincerely and objectively considers the evidence can come to any other conclusion about Jesus than that He was exactly who He claimed to be -- The Son of Almighty God, and as such God in the flesh. The Bible is flawed, and there are probably errors even in the passages just quoted. However, one thing is clear: Jesus was God. This theme is repeated directly or indirectly in almost every page of the Gospels. In the earlier example of the flawed book about JFK's inauguration, the fact that he was inaugurated would not be questioned; there's just too much evidence. In the same way, while the Bible may be flawed it is still nonetheless a valuable historical document, and Jesus' divinity cannot be questioned; there's just too much evidence. To cut out Jesus' divinity one would have to throw away most of the New Testament -- the most popular book in all of history and the most authentic book of antiquity. That may sound like an inappropriate question for a Christian, but we need to remind ourselves at times in order to strengthen our walk. If Satan can sow the slightest doubt, it will hinder us. Without beating around the bush and putting it simply, Jesus was God's only Son and as such was literally God in the flesh. Non-Christians, and many Christians, too, would say that this statement cannot be proven; it takes blind faith to believe it. While it does take faith to believe it, it does not take blind faith! And if one says it cannot be proven, then one must also say that no other ancient history can be proven. The Gospels are more authentic than any other works of antiquity, and they surely show Jesus to be divine. He did all manner of miracles, claimed numerous times to be God's Son, promised eternal life to His followers, and rose from the dead as He promised. Even secular history confirms that He lived, died, and has been worshipped as God by millions upon millions of people for the last 2000 years. No other great religious leader ever claimed to be God -- not Buddha, Confucius, nor Mohammed, and no one who ever lived has convinced a large portion of the population that he was God -- except Jesus Christ. Only in the name of Jesus are many documented miracles still performed today. 2. He was put to death by crucifixion. 3. He was buried in an accessible tomb; that is to say, people knew where it was. However, in later centuries the place was forgotten and today there is controversy over the exact location. 4. His tomb was empty three days after His burial and no one ever produced the body of Jesus. If anyone could have, it probably would have ended Christianity. 5. His disciples preached Him raised from the dead. 6. His opposition tried to disprove it. 7. The disciples fanned out to the ends of the Earth and kept the same story, for which, tradition holds, they all died except John. Almost everyone agrees that Jesus lived and was a great and good man. However, fewer have accepted Him as God incarnate and the saviour of their soul. Could Jesus have been a great and good man and lied about his identity? He claimed numerous times to be God's only Son and the redeemer of all mankind. Here are just a few examples: "I am telling you the truth," Jesus replied. "Before Abraham was born, 'I Am' " (John 8:58). Also see Exodus 3:12-14. Again the High Priest questioned him, "Are you the Messiah, the Son of the Blessed God?" "I am," answered Jesus, "and you will all see the Son of Man seated at the right side of the Almighty and coming with the clouds of heaven" (Mark 14:61-62). Jesus said to her, "I am the resurrection and the life. Whoever believes in me will live, even though he dies; and whoever lives and believes in me will never die. Do you believe this?" (John 11:25-26). Have you ever heard Jesus compared to other great men of history, such as Buddha, Socrates, and Muhammad, or even Lincoln or Gahdhi? The world often likes to classify Jesus with such men, and make statements like, "Jesus was another great and good man sent to help us understand. Such men have appeared several times throughout history." Yes, Jesus was another great and good man if one forgets the following "minor" points: (1) Jesus was God, claimed to be God, and is the only person who has ever convinced a large portion of the population that he was God. (2) Jesus did countless miracles, including raising the dead. Why do you realize that of the five other men mentioned in the first paragraph, none ever did miracles? In addition...(3) Jesus promised eternal life to his followers. (4) And only Jesus can claim an empty tomb by means of resurrection from the dead. (5) Jesus allowed his death to happen for our sakes as payment for all the sins of mankind. Of the other men mentioned above, only Socrates allowed his death, and none of the deaths had any life-giving significance. For example, Buddha died at age 80 from a meal of bad pork. Jesus was just another great man -- if one ignores everything significant about Him. Jesus compared? As many of you know, I was saved at Christmas time, 14 years ago (Christmas 1973). It was my freshman year of college, and I was living at home and attending a local Junior College, El Camino Junior College near Torrance. We lived near the beach in Torrance. All during my high-school years, I had thought much about the meaning of life, and was very determined to find it. I was quite depressed and withdrawn, despite the fact that I had a very happy home, some good friends, and was successful in academics and sports. As a child, I had grown up in a traditional Catholic Church, but I never really got the message. I believe this was due to problems in the Catholic Church (not to say that it is the only denomination with problems) and to my own stubborn desire to follow my own path. At any rate, due to my search for truth in my teens, I began to realize (towards the end of high school) that Jesus just might indeed be God. However, I wanted to make my own determination of this, being as objective as possible. Therefore, as one of my Christmas presents, I asked for a historical work on Jesus. One of my cousins (Marta Ruble) gave me a book called The Life of Christ, which she had purchased from a Catholic library. It was a rather lengthy (about 700 pages) and scholarly work written in 1941 by an Italian author, Giuseppe Ricciotti. In late December, I remember laying on my bed and, after a cursory examination of the book, opening it up in the middle. I began to read the right-hand page about a third of the way down from the top. Jesus was walking along with crowds of people right beside Him. Suddenly He stops and asks, "Who touched Me?" The narrative went on to describe Jesus' healing of the woman who touched His cloak, and the raising of Jairus' 12-year-old daughter from the dead. The author, Ricciotti, described several interesting Jewish and historical aspects surrounding the events. He also compared the different Gospel accounts. However, more significant than this was the fact that God was also quickening my mind to several interesting aspects surrounding the events! My mind instantly went through a very simple, yet powerful, line of reasoning. First, this was a story about God, because even in this short story, Jesus' actions, mannerism, and words clearly revealed His divine nature. Second, it could not have been made up, because if it had, the person who made it up would have to have known God and exactly how He would behave "in the flesh." And any human being who had such knowledge would not lie and make up such a story. So I had found God! In addition, I realized that I had found Him, and the truth, before it was too late. There was still time to turn to Him, but how? What did He want? Well by "coincidence" I then turned many pages in the book to the story of Jesus and Nicodemus. In a matter of days I was a Christian.